Pregnancy and new motherhood is often described as the most rapidly transformational time in a woman’s life. Not only does a woman experience phenomenal changes in her physical body, but she also goes through tremendous change emotionally, mentally, and spiritually as she makes the shift to a new way of being. She becomes a new version of herself: she is born as a mother. There are numerous pranayama breathing exercises that are safe and effective techniques to aid in a peaceful adjustment. And when mother is peaceful, baby feels and begins to learn peace as well. The following pranayama breathing exercises can be done for 3 or 11 minutes when sitting to meditate with the breath. They are wonderful additions to a yoga practice. 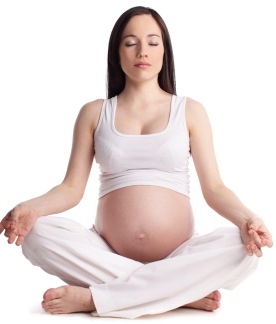 (Ideally, mothers can find Prenatal or Postnatal Yoga classes locally to attend since there are unique needs and modifications during those times.) These techniques are also great to sprinkle throughout the day as a brief re-centering and usually can even be done while snuggling a baby. The benefits of long deep breathing include relaxation, stress release, stimulation of endorphins that fight depression, expansion of lung capacity and an increase in patience. This breath balances the hemispheres of the brain, creates a sense of harmony and well-being, helps relieve stress related tension headaches, and brings mental and emotional balance. Close your eyes and begin to slow your breathing (breathe through the nose). Let your left hand rest on your left knee with the palm facing up and your index finger and thumb tips touching in gian mudra. Curl your right hand into a fist except for the index finger and thumb, which will remain comfortably extended. Use your right thumb to press your right nostril closed so that you can now inhale through the left nostril. To exhale, press the left nostril closed with your index finger to allow the breath to release through the right. On the next inhale, breathe in through the right nostril and then exhale through the left. Whichever nostril you exhale out of, that will be the nostril through which you take your next inhale. Continue directing the breath through the alternate nostrils in this way. As a cooling breath, Sitali Pranayam is great for soothing heated emotions such as anger and frustration. Additionally, it can actually help cool the temperature of the body. It is reported to lower fevers and aid digestion as well as increase alertness. Round the lips into an “O” formation. Roll the tongue into a “U”, with just the tip of the tongue sticking out of the rounded lips. (Some people are unable to roll the tongue in this way due to genetic disposition. If you can’t roll the tongue, do this breath just with the lips rounded.) Inhale through the mouth, drawing the breath through the tongue (as if the tongue were a straw.) Exhale smoothly through the nose. Close your eyes and focus on the breath, continuing the cycle of inhaling through the tongue and exhaling through the nose. For more pregnancy and postpartum yoga and meditation practices you can do at home, try the book Bountiful, Beautiful, Blissful by Gurmukh. It is full of great information, stories, and practices. And be sure to check out the sweet songs and sacred mantras of Snatam Kaur’s newly released Divine Birth CD, especially for pregnancy and parenthood. Bringing peaceful practices into daily life not only makes for a happier mother, it is a practical and conscious way of teaching peace to the next generation. It is very useful information.I think everybody must do yoga & pranayam.